It shocks me, still, when famous people with large fortunes die without a will. Latest case-in-point: Aretha Franklin. One of the best singers of my lifetime, Aretha died a couple of weeks ago at age 76. She was married twice, but long divorced and living as a single woman. But she leaves four children, one of whom reportedly has special needs, and an estate reported to be worth $80 million. Despite her larger-than-life public persona, Aretha reportedly was an intensely private person off-stage. It’s sad that dying without a will ensures that her private holdings will be examined in open court and divided among her survivors according to Michigan law. A will would have divided her estate according to her own wishes. An estate plan could have set up a trust for the son with special needs. These simple steps would have avoided public court proceedings and sizeable legal costs that will reduce the size of the estate, instead of going to the survivors. But like Prince, Michael Jackson, Elvis Presley and so many other celebrities who died without a will, we can expect a stream of media coverage about the content of her estate holdings, as the probate court in Oakland County, Mich., divides it up according to state statutes. Disputes among the children could add nasty turns. The child with special needs will get extra attention, when that may have been the very last thing Aretha would have wanted. Your personal estate may be a lot less than $80 million. But please don’t get caught in this situation. If you are reading this newsletter and you have yet to record a will or plan your estate, please contact an attorney to take the critical basic steps. Act now for your estate to be handled according to your wishes. 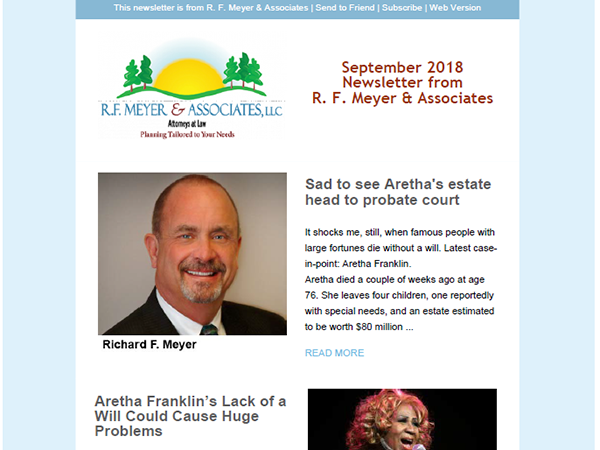 We have an article in the new R. F. Meyer & Associates September Newsletter about Aretha dying intestate (without a will). Also included are articles on Medicaid/elder abuse, long-term heath insurance and todays’ best online life-expectancy calculators. I hope you enjoy the stories and find the information valuable. Find a link to the full newsletter PDF below. 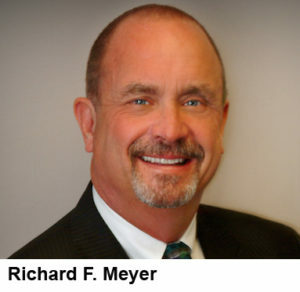 Please contact the law offices of R. F. Meyer & Associates today if we can provide help with your estate planning, probate, special needs trust or Medicare issues. Reach us by calling 614-407-7900, emailing info@elderlaw.us or filling out the contact form on this site at ElderLaw.US/Contact.